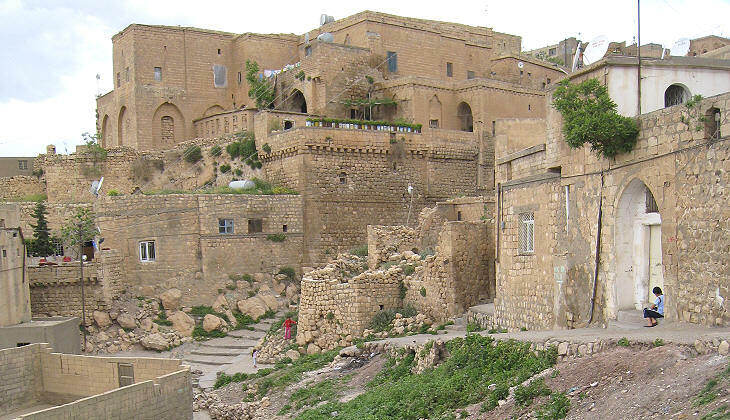 Mardin is located on the western slope of an isolated mountain which reaches an altitude of 1,300 meters/ 4,300 ft. 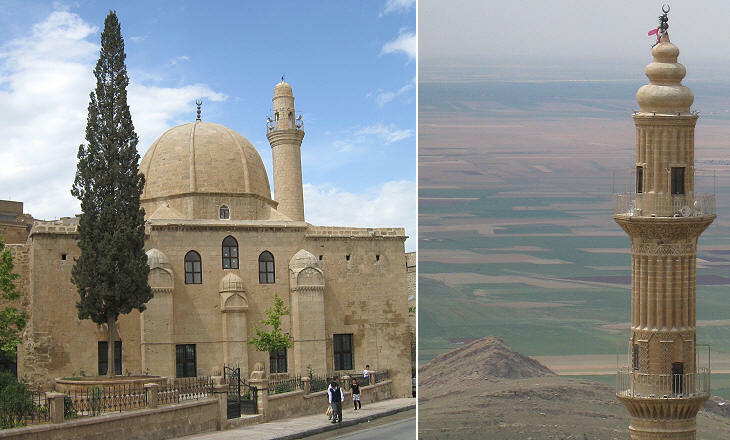 The town commands great views over the Mesopotamian plains even beyond the border between Turkey and Syria. The rocky peak of the mountain has attracted the attention of settlers since the earliest days of civilization; its cliffs made it a naturally fortified site. Due to its strategic position the control of Mardin was disputed between the Romans and the Parthians and later on between the Byzantines and the Sassanids. It is not easy to identify with precision the date of construction of the remaining bastions and towers of the citadel; they most likely belong to the periods during which Mardin was ruled by the Marwanids (XIth century) or by the Artukids (XIIth century) when the town was the capital or the second most important town of a small independent emirate. The citadel was able to withstand very long sieges: a siege which lasted two years is recorded at the beginning of the XVth century and in 1516/17 the Ottomans had to wait nine months before the garrison surrendered. Even today (May 2009) the citadel is regarded as a military zone and it is not open to the public. 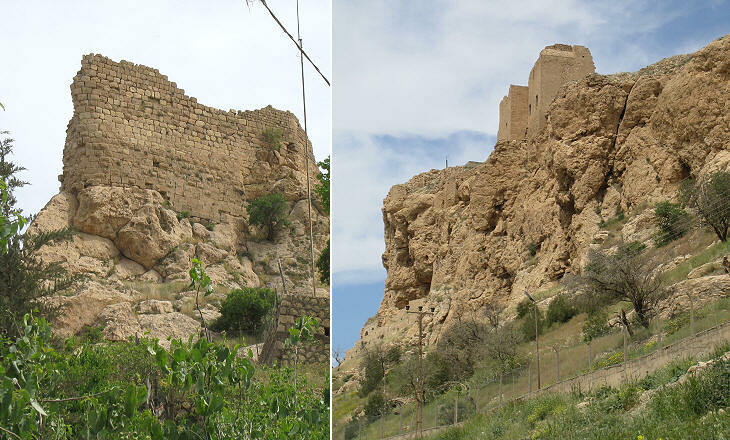 The side of Mardin towards the plain was protected by modest walls which had the main purpose of defining the boundaries of the town for the collection of duties. Short stretches of these walls have been incorporated into houses. 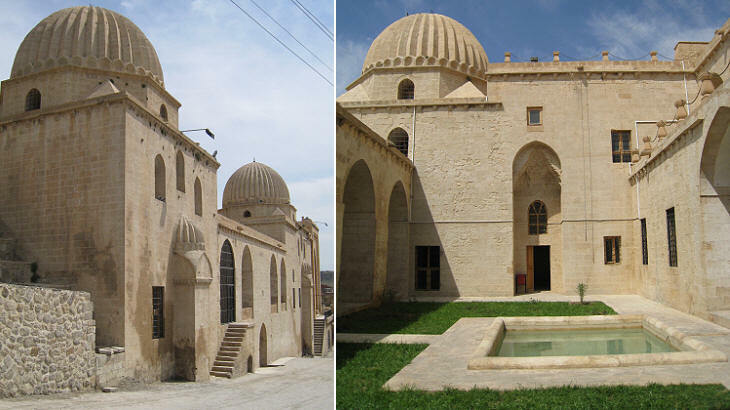 The Great Mosque of Mardin is the result of many changes made during its long history; inscriptions date its construction to the XIIth century during the Artukid period but only a few minor parts of the complex belong to that period; the minaret is mainly a XIXth century reconstruction of an earlier minaret which was very similar to that of Safa Cami in Diyarbakir. The base of the minaret however has not been modified: the columns and the decoration of the small portal are based on patterns of the Artukid Ulu Cami porticoes in Diyarbakir. 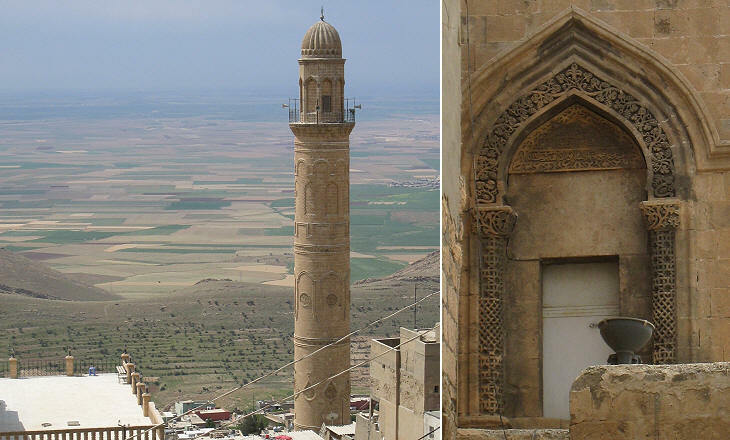 A characteristic of the monuments of Mardin is the presence of ribbed domes of Persian origin. Sultan Isa Medresesi was built in 1385 by the Artukid rulers of the town; this dynasty was forced for more than a century to accept the overall sovereignty of the Mongols, but towards the end of the XIVth century managed to regain its independence. The construction of monumental portals is typical of Persian Islamic art but it can be observed in the Seljuk Sultanate of Rum and in Central Asia too. Teardrops were used for inscriptions in praise of God; they should be usually read starting from the lower-right hand corner. This medrese is located immediately below the citadel and it served as an astronomical observatory. In 1400 Mardin was taken by Timur who after his return to Central Asia, left the town under the control of a federation of Turkish tribes known as Kara Koyunlu (Black Sheep Clan). 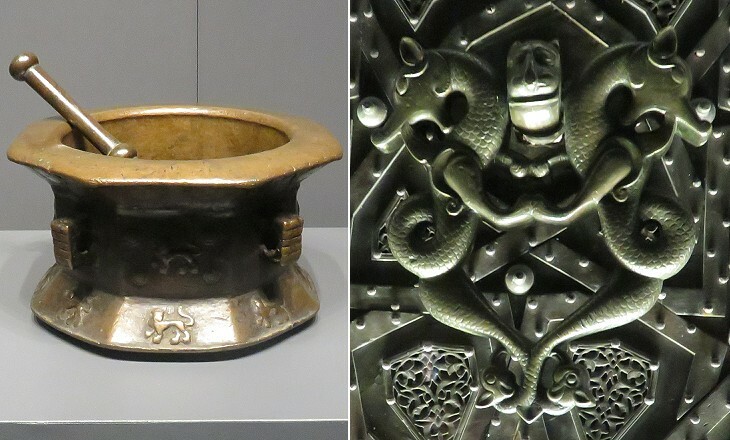 In the second half of the XVth century the Kara Koyunlu clashed with the Ak Koyunlu (White Sheep Clan) who controlled Diyarbakir and in 1462, they lost Mardin. The construction of Kasimiye Medresesi took place during the Ak Koyunlu rule; the building is very similar to Sultan Isa Medresesi, but it is located at the foot of the mountain. The very high and deep porticoes protected the students' cells from direct sunlight and they favoured air circulation. 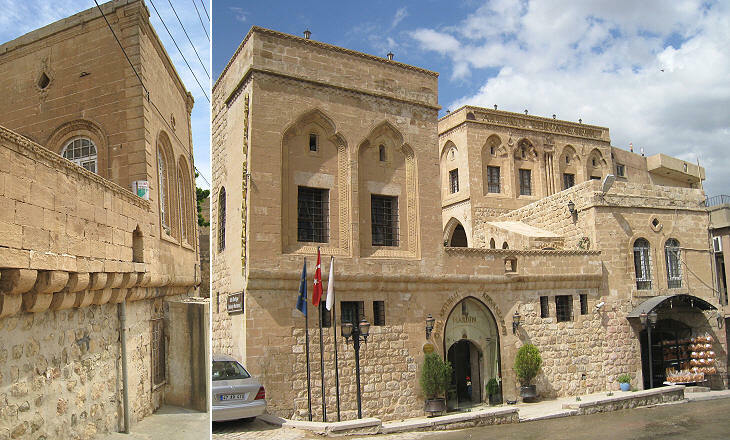 Notwithstanding its altitude Mardin has very hot summers which influence the design of its buildings. 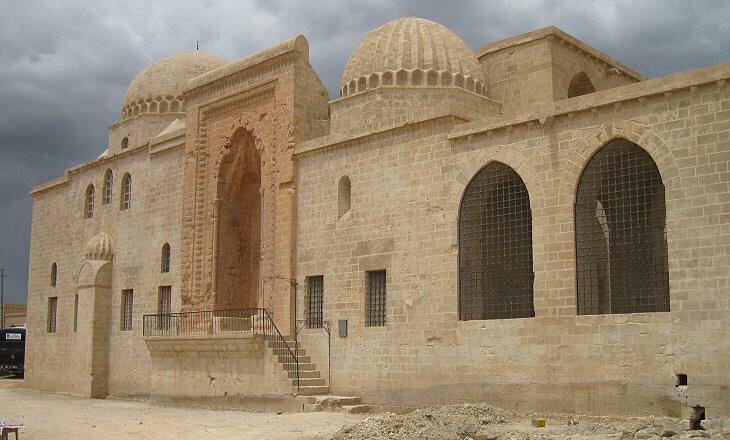 At the beginning of the XVIth century Mardin was conquered by Shah Ismail, the founder of the Safavid dynasty, but after a few years the town was taken by the Ottomans after a long siege which greatly reduced the population and the importance of Mardin. 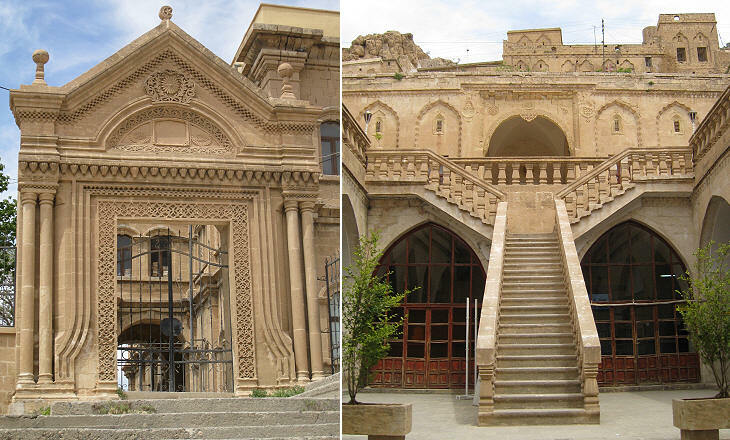 The Ottomans did not build major monuments but they restored/modified the existing ones. Melik Mahmut Camii is a mosque of the XIVth century; the three small apses which indicate the direction to Mecca, are similar to those of Silvan's Ulu Camii which was built by the Artukids. Sehidiye Camii is another old monument, but its minaret was rebuilt in 1916 in a mixture of styles. 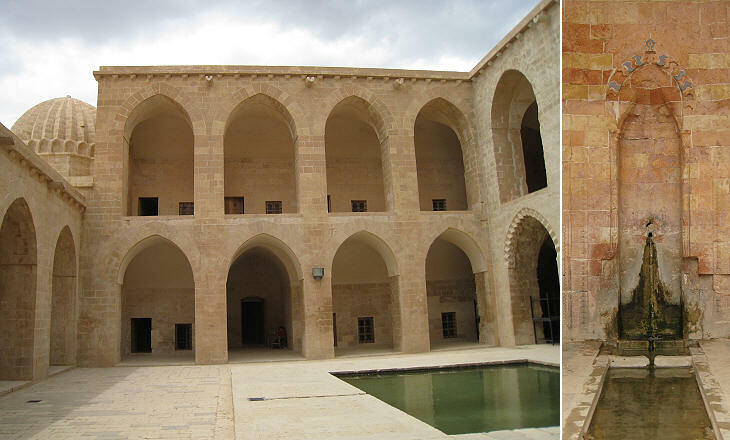 Similar to Kilis, the buildings of Mardin are characterized by the use of a limestone which over time acquires a very warm tone; it can be easily worked to obtain all forms of decorations including inscriptions. 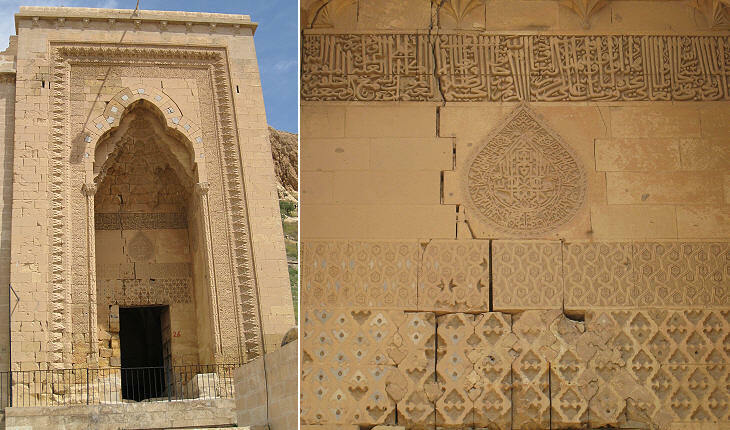 The image used as background for this page shows a limestone inscription at Ulu Cami. 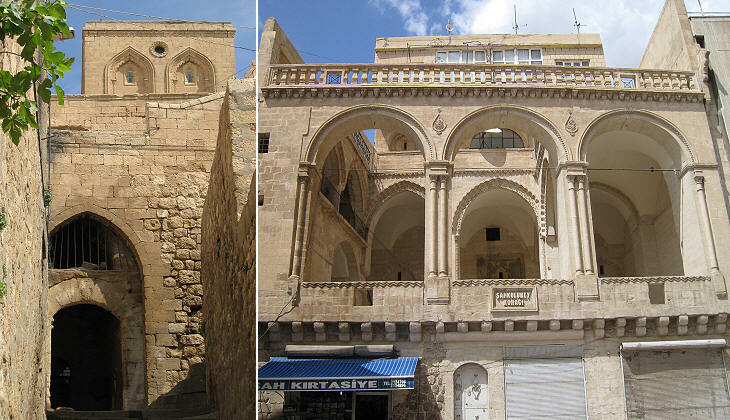 The houses of Mardin are carefully arranged in tiers on the mountain slope so that the roof of each house serves as the terrace of the one above. The streets are connected via a network of passages known as abbara that sometimes pass directly under the houses. The abbara provide shelter from thehot sun in summer and from cold weather and rain in winter. Donkeys and mules are still used to move around the old town’s narrow and steep streets; you can see them in the introductory page.